Simplify your audit process with a centralized internal audit tool. Having an effective internal audit software system allows businesses to identify its strengths and weaknesses. To leverage internal audit for future success, the key is to have the right tools to support the people and processes, reduce audit cycles and deliver value to stakeholders. 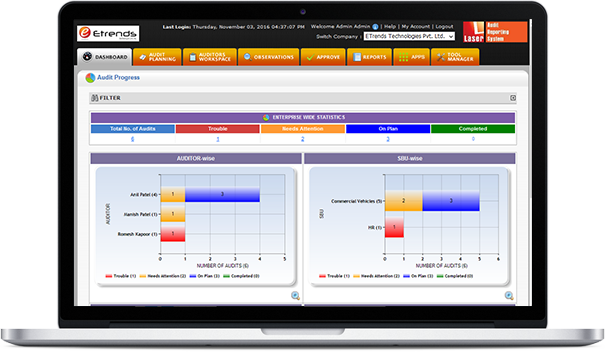 The Laser Audit Reporting System (LARS®) is a web-based solution that puts you in control of the complete audit lifecycle by establishing a systematic, disciplined and a uniform process for internal audit management. Get real-time completion status of ongoing audits at all locations. Centrally manage audit planning, audit programs, work papers and fieldwork and coordinate information among Auditors, Auditees and Management at all levels of organization. Bring Auditors, Auditees and Management together. Establish a transparent, uniform and centralized process for internal audit management at all levels of an organization. Get real-time completion status of ongoing Audits at all locations. Get ageing analysis of all open observations by importance of observation, department and by SBU. Get real-time progress and completion status of ongoing audits at all locations at a single glance. Automatic reminders and escalations result in completion of assigned activities within the target date of completion. Keep track of planned, unplanned, dropped, ongoing and completed audits. Keep all information of an audit area centralized at one place. To download the features of LARS® etc features, please click here.